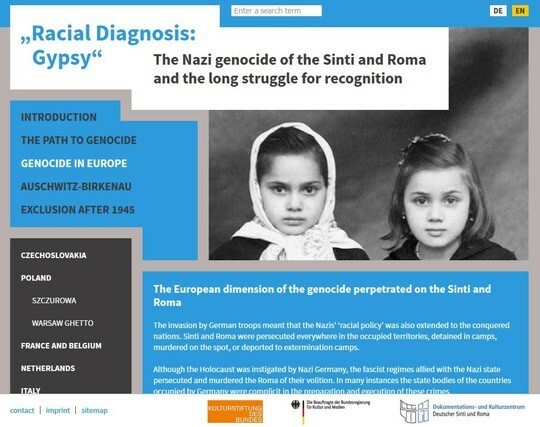 On the occasion of the upcoming April 8th – International Roma Day, the Documentation and Cultural Centre of German Sinti and Roma launched its new English website “‘Racial diagnosis: Gypsy‘. The Nazi Genocide of the Sinti and Roma and the long struggle for recognition“. Under www.sintiundroma.org/en the Holocaust of the minority is addressed by showing numerous videos, interviews, photographs and documents. Furthermore the website documents the history of the survivors in post-war Germany, the success of the civil rights movement and the human rights situation in Europe after 1989 as well. April 8th is celebrated each year by Roma organizations across the world, as the International Roma Day. As a day of action it recognizes the contribution of the Sinti and Roma minorities to the cultures and histories of European societies as Sinti and Roma have been resident in Europe for more than 1.000 years. The ROMADAY calls for solidarity and sets a signal against antigypsyism and discrimination. 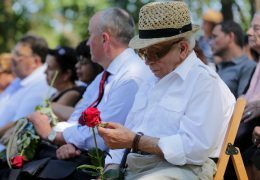 The unprecedented Nazi genocide of the Sinti and Roma is part of the mutually shared history of both minority and majority. A prerequisite for this was the antigypsyism that was deeply rooted in European history. With its new website www.sintiundroma.org/en the Documentation and Cultural Centre of German Sinti and Roma aims to refute prejudices and hostilities on the one hand and, on the other hand, to document the genocide of the Sinti and Roma: from the ostracism and disenfranchisement of the minority in the German Reich to the systematic extermination in occupied Europe. The inhuman perspective of the perpetrators is contrasted by the victim’s testimonies. Historical family pictures of Sinti and Roma provide an insight into the people’s daily life and let them stand out as individuals. These self-documentations show the people in their individuality and personality and provide an important counterpart to the “gypsy clichés” that remain very powerful until today. They illustrate the destroyed lives and destinies behind the abstract documents of the bureaucratically organized extermination. Also a theme is the history of the survivors in post-war Germany, who were recognized only very late as Nazi victims. It was the civil rights movement of the German Sinti and Roma that made the ideological and personal continuities from the time of the “Third Reich” part of the social debate. The exhibition ends with an outlook on the human rights situation of the Sinti and Roma minority in Europe after 1989. The content of the webpage is based on the portable exhibition “‘Racial diagnosis: Gypsy‘. The Nazi genocide of the Sinti and Roma and the long struggle for recognition“ which was completed in 2017; however, it is expanded by numerous videos, photographs and documents, which cannot be shown in the exhibition due to lack of space. The webpage www.sintiundroma.org/en provides a contemporary tool for educators and teachers to raise awareness of young people about the history of the Holocaust of the Sinti and Roma for instance in the context of a teaching unit. Due to its intuitive menu operation the webpage is also suitable for independent studies or to gain a deeper insight into the subject. The portable exhibition and the web page “‘Racial diagnosis: Gypsy‘. The Nazi genocide of the Sinti and Roma and the long struggle for recognition“ is funded by the German Federal Cultural Foundation.